Whew! After 7 weeks unemployed and storm after storm leaving me exhausted clearing snow from driveways and roofs, I was getting desperate for shop time. Now that I'm settling into a new job, I decided to tackle something that's been nagging me for a while, a popular topic on many blogs: shop reorganization. 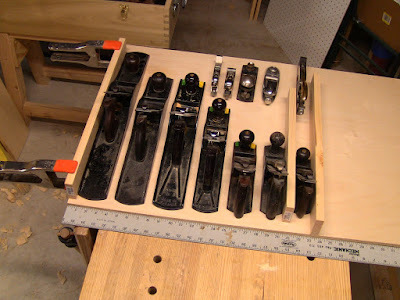 I wanted to put away the unused power tool accessories and make my hand tools more accessible. However, I also wanted to keep it simple and not turn it into a major home-improvement project. After taking note of various hand tool setups I've seen in photos for the past year, I picked a couple ideas I liked. I hate the look of pegboards, plus the hooks are always falling out, so replacing them was a high priority. I much prefer the look of wooden-walled shops, but lining entire walls with pine boards gets expensive. 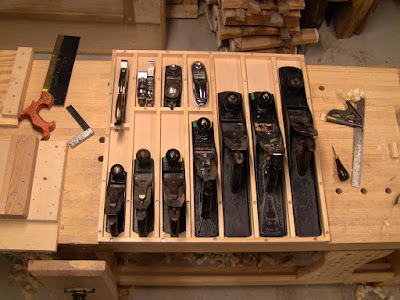 In the book Great Workshops from Fine Woodworking, Carl Swensson has a brief article on making modular wooden panels that can be hung from a cleat, so that offers the attractiveness of natural wood at modest cost, with a lot of flexibility. Various simple holders can be nailed to the panel and reconfigured easily. I also wanted to make my planes easy to grab, so I'm building an angled plane till similar to the one Christian Becksvoort featured in a recent tool cabinet. Derek Cohen and Kari Hultman also have similar tills. My guiding design principles are pretty simple: have everything out where I can see it, and place tools at roughly arm height just a couple steps to the side of my bench. And no horizontal surfaces where I might be tempted to pile things up! That way I can put my hand out and grab something quickly, and just as easily put it back in its proper place. The angled plane till will hold the planes in approximately the proper orientation for use, so I don't have to pull them out at some awkward angle and twist my wrist around. Just grab and go. Laying out the plane till first on a quarter sheet of plywood. Allowing for 1/2" dividers and an extra margin a little over 1/4" per plane, this comes out to 24" wide by 24" tall. Now I know how much space it'll take up. Swensson's panels require anchoring cleats securely to the wall. 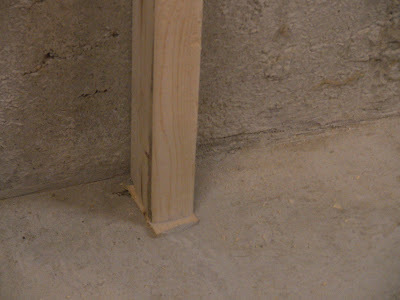 However, my basement shop has solid concrete walls and floor, so attaching anything to them is difficult. 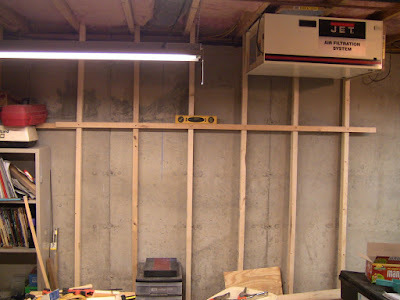 The simple solution I used for my original pegboards was to hang half-length 2x3 studs from the exposed floor joists overhead with screws, and secure the pegboards to those. 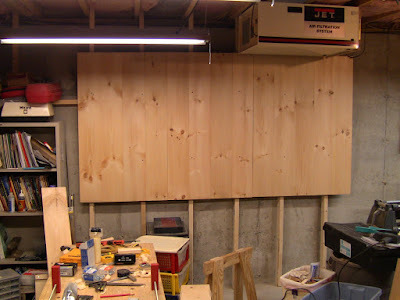 For these panels, which I expect to hold more weight, I used full-length studs, wedged at the floor for rigidity. 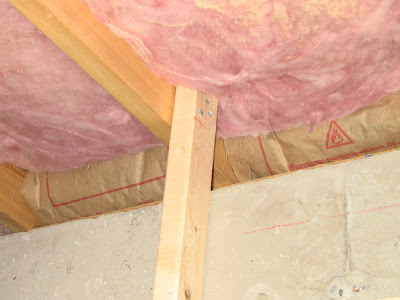 A fancier option would be to build a proper stud frame with top and bottom plate and secure it to the bottom of the joists as a curtain wall. The studs in place against the concrete wall, with a 1x2 cleat mounted level across them. Detail showing the sophisticated method for screwing the stud tops to the floor joists. Detail showing the even more sophisticated method for wedging the stud bottoms against the floor. The wedges are ripped from the end of a stud scrap. 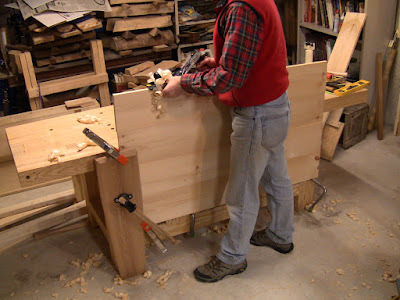 Swensson's panels are glued up to 24" widths, with a French cleat across the top edge. In order to be able to screw mine directly to the studs, I made them about 32" wide, with 1x3 cleats across the middle like fence sections. 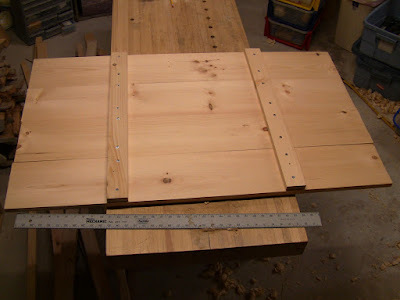 With studs on 16" centers, each panel spans two of them. One panel built up, made from cheap home-center 1x8 pine, complete with authentic twist, warp, and cup. The boards are edge-glued, with cleats securely screwed across the back. Other than jointing the edges for a secure bond, I left them as is, no attempt to clean them up; I like the rustic look. You may prefer a more finished appearance. The panel top cleat hangs on the stud cleat. This is more for ease of mounting single-handed than for permanent support, like hanging cabinets. One side or the other can be shimmed to get a close fit between panels before putting in four heavy screws through panel front, back cleat, and stud. Squaring up a panel to fit against its neighbor. Three panels hung on the studs. This gives me plenty of room for hanging tools, and there's room to add another on the right. It took me three tries to decide on the mounting height, experimenting with one panel. I started flush with the top of the wall, but that looked too high. Then I tried down a foot, and that looked too low. This ended up looking just right, with my eye line 18" down the 48"-high panels. In addition to being pleasing to the eye, that puts everything within easy reach without having to stretch or stoop. The assembed rack for the plane till, 1/2"x3/4" borders and dividers screwed to a 1/2" plywood base. The borders are also glued, but the dividers just have two screws to allow easy rearrangement. The rack of the plane till will sit at an angle in a simple shelf unit. The unit will have upper and lower shelves for wooden molding planes, and will be mounted on the second wall panel. At that position, it will be directly to my right as I work. Two steps to the right, grab a plane, two steps to the left back to the bench. I experimented with the loaded rack at different angles to see how shallow I could make it. At a comfortable 60 degrees, it extends out 12". At higher angles, the larger shoulder plane starts looking a little unstable. I've seen setups with planes mounted vertically, but they always require additional cleats or latches to hold the planes in place, which is something that slows down access, violating my design principle. Reorganization can be a pain or a joy. One thing I agree with you on is "no horizontal surfaces". It's my deal killer too. I can pile more crappola on one square inch of a horizontal surface then you can imagine. I think I might try your system out. Why wedge the bottom of the studs and not just let them sit flush on the floor? I wedged them because I wanted to be sure of good contact with the floor, for good support. The corner where concrete wall meets concrete floor is a little rough in spots, with small lumps of concrete. The wedges compensate for any variation. Correct, not a French cleat. Just a cleat across the boards to make up a panel, and then screw that whole assembly directly to the studs. A French clear would be better, but would require a little more care. As you might have noticed, one of my goals here was simple, simple, simple! To the point of being crude, but effective. Thanks for your responses. I like this system, I have to get my tools out of cardboard boxes.